Skating ability, personal goals, and budget play a role in determining what is the best choice for each individual. Once I have some insight into where a skater is, and where they want to go, I can make the right skate recommendation to get them there. With the Rollerblade® website at my fingertips, selecting the best skate is easier than ever. As a dedicated skating instructor, my emphasis is always on skaters mastering the basics. They are the foundation of all skating disciplines, including skating for fitness. If the goal is to improve fitness levels through skating, then maximum control, the ability to stop and turn quickly, and feeling comfortable and stable in a variety of skating situations are keys to a positive experience. The Zetrablade is perfect for skaters in this category. The Zetrablade is the entry level skate of the Rollerblade X-Fit line. It comes with 4 x 80mm wheels and a high and comfortable upper and cuff for maximum support. This is the best skate to learn the basics of striding, turning, and stopping. For the more experienced skater that has a strong command of controlling speed and turning in a variety of skating environments, and wants to increase their time and distance on skates, the Macroblade 110 3WD will do the trick! From a crusing night skate through a big city, to a high intensity cross training or distance workout, this skate covers just about every kind of distance skate. Even first time marathoners will enjoy themselves as they will likely skate further, faster, and more comfortably than they ever thought they could. The Macroblade 110 3WD is a 3-wheeled skate with longer frames and bigger, 110mm wheels. It is also the most versatile skate in the Rollerblade X-Fit range offering cutting edge technologies and premium hardware. Skaters who desire to improve their race performance and ranking but still like the option of having a skate with ankle support when training in challenging environments should consider the Endurace Pro 125. Technique and speed continue to improve with this revolutionary 2-in-1 premium marathon skate. The Removable Cuff System (RCS) changes the skate from a medium height cuff to a race style skate with superior padding, offering more support within seconds. The Endurace Pro 125 with its carbon shell reinforces efficiency in the stride and balance when gliding. Finally, for the elite racer who is looking for a high performance skate and the competitive edge that comes with it, the Powerblade Pro 125 is the skate to get the job done. The pinnacle of speed is skating the low carbon boot Powerblade Pro 125.This skate is specially designed to meet the performance and demands of top speed skaters. The heat moldable boot gives a perfect custom fit for the best possible race. Rollerblade® offers a complete line of products that has all skaters covered. 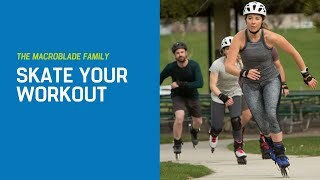 Beginning fitness skaters, distance skaters, as well as cross training athletes such as skiers and runners, will find what they need with the wide range of Rollerblade® X-Fit skates. The competitive skating athlete will lead the pack with the premium marathon and high performance skates. Rollerblade®’s complete line of products makes answering the question, What skates should I buy?, easier than ever.